I am a self-taught artist and have been painting mandalas on silk since 1999. In 2000 I birthed the name Silk & Art and began to sell my artwork not only as individual commissioned paintings but also as cushions, pictures, hangings and scarves. I was asked to start teaching silk painting and so offered individual tuition as well as group workshops where I guided people to create their own individual mandalas. Today a selection of my mandala paintings are available as greeting cards. My main focus is on teaching and coaching as well as avid blogging and vlogging, but I continue to undertake commission work and create personal mandalas as well as a select few silk items. 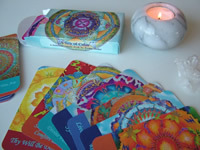 I have also created a set of mandala guidance cards which I use in individual sessions with people to help them take stock of their lives and then take the next step forward. If you’d like to have a look at a selection of my artwork, please follow this link to http://www.silkandart.com. I also have a Silk & Art Fan Page on Facebook so do come over and join us to keep up to date with all the art based activities. If you would like to know more about my silk painting commission work, please contact me at: info@silkandart.com. I look forward to hearing from you. Great blog. I love your willingness to share your knowledge. Your art is incredible and so uplifting. Thank you so much for your supportive comments and appreciation of my work. please could you give me an email or the like and I can tell you more about this. We can discuss what you need. Donna, sorry to hear that is happening. It can be really frustrating when you complete your work only to have problems with the fixing. I was just wondering what brand of steamer you have Donna. I work with a horizontal one and don’t have the same difficulties that many have with the vertical ones. I’m guessing that there is not a big enough gap between the water the silk and that dampness travels up by osmosis. How do you secure the bottom end of the silk roll? Do you wrap the whole package up in fabric, in extra paper? Do you have masking tape wrapped around the bottom to securely close off the gap? It would be really great if you could send a photo so that I could see the setup. Is there any way you could increase the gap between the water and your silk? I also wanted to clarify that the bottom of the roll gets wet during the steaming and this ruins the silk? Or does the bottom get wet but your silk is okay? My silk roll is sometimes a bit wet when the steaming is over and I leave the package in the device to cool down. Water droplets then may drop on it, but the dyes are fixed and so it isn’t a problem. please stop calling what you do ‘art’ – it’s craft at best! The fact that you exhibit it in Glastonbury amidst the many other works of ‘art’ in so called ‘galleries’ like the Grail Centre (how dare they connect the Grail with this former shoe shop anyway), and ‘give’ arrogant ‘interviews’ to other ‘artists’ (everyone’s an artist in Glasto!! ), doesn’t change that…. Thanks for stopping by and commenting. There’s always space for everyone’s point of view. Some people are going to adore the mandalas and others like you may think it’s pants. That’s perfect too. And this is wonderful for sparking off a new conversation. Thanks a lot. And watch this space. Hi Fiona, I’m in love with your work!! It is awesome.. I would like to learn.. Any news on online classes??.. please keep me posted..
Hi Zaidy – so glad you love my work. I am currently working on things to offer online. I am very close to launching an instructional video too which might well interest you. If you would like to keep updated, please join my mailing list and you will automatically receive updates. If I have your permission, I will add your email address. Lovely to hear from you and glad you feel inspired by my artwork. I will gladly add you to my mailing list. I will also send you an email with details about the dvd and what you could do with your class. I really want to try your salt method on a silk scarf but I have zero talent in the creative department. So I was wondering with someone who has no idea what I am doing, could you tell me what dye is best to start with. I don”t want to spend lots of money on equipment so could I iron the silk after it is dyed instead of using a roller. And would the color of red, blue and purple mix on the silk well. Thank you and I hope I didn’t ask to many questions. No worries about asking questions. So, a couple of things about the salt method. If you are using dyes as I do, they have to be steam set afterwards. If you want to iron the silk after it has dried, please buy some small bottles of silk paint either online or from your local art and craft shop. 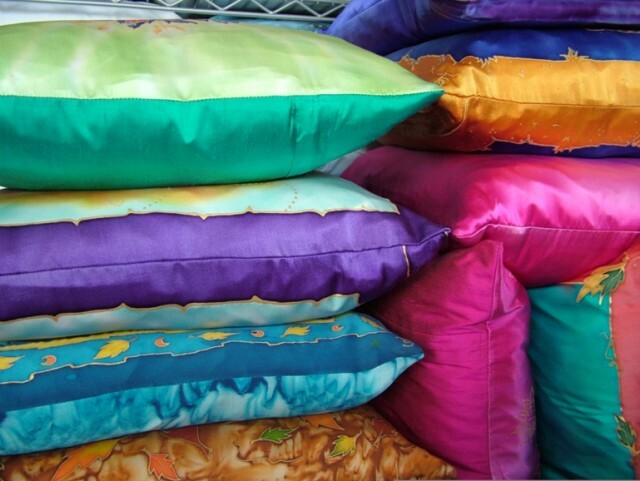 These are made with pigments and sit on top of the fabric. They are set through heat. It must say silk paint on the label. And you should be fine with that. Experiment and have fun. If you soak the silk beforehand and then squeeze it out, the paints will run and mix nicely. Red, blue and purple should interact nicely on the fabric. Have fun. If I was to do the steam method will that work in a microwave by any chance. And should I soak the fabric in white vinegar first. Thank you again. You’re welcome. And regarding the microwave, no you can’t do the salt technique combined with the microwave. Normally salt is put on and you have to let the silk dry with the salt on it. Dry or semi dry silk can’t be put in the microwave. Only soaking wet silk. You can always wash your silk first to remove any residue from the silk worms as well as any chemicals that might be in it. Then soak it for a bit in a vinegar and water solution. This intensifies dyes. Thank you, and it does help. At least I am learning what I can and can’t do. Thank you for all your help. I’ve already talked to people at the art store & fabric store – they had very limited knowledge base. But they did have good silk dye. In the process of doing internet research, I discovered your beautiful website and inspiring creations. I have some questions – perhaps you can help, or direct me to a reference book. 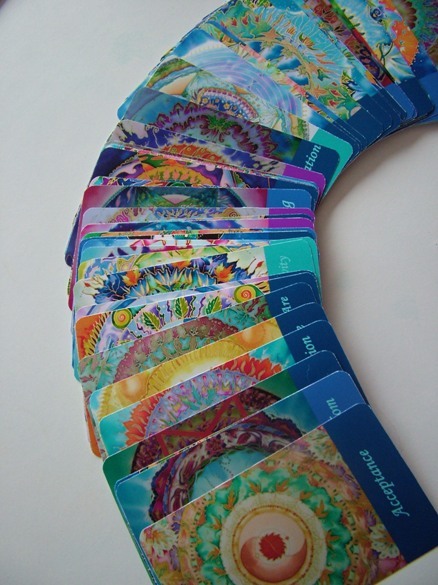 My daughter is 16 yrs – loves vibrant fun colors & loves accessorize with scarves. I want her to successful – something that she’ll be proud to wear. FABRIC is my big concern: I am not clear as to the exact kind of fabric used – and uncertain the relationship between chiffon – silk – crepe de chine . Is it ‘pure silk’ or a poly blend? Can I purchase by the yard? Is it difficult to finish the edges on the sewing machine? What dimensions for a teenagers scarf? Which fabric for a scarf? for a shawl? I’m open to any other direction. Thank you very much for your help and time. I appreciate your sharing your talent. thank you for contacting me. Let’s get you up and started as quickly as possible. Making a silk head scarf is a beautiful idea. I would suggest buying a ready made silk scarf, one with prerolled edges and then you don’t need to do any sewing afterwards. You can buy habotai or pongee (both thinnish wafty silks). You can also buy crepe de chine which is also 100% silk and has a beautiful weave giving it a unique texture. This quality has a lovely drape. Chiffon is sheer, very translucent, beautiful to work with but for this purpose I would say go for the crepe de chine or habotai. I’m not sure where you live so will give you dimensions in both cm and inches. Get one that is 35cm x 180cm (approx. 14″ x 72″). That will enable her to tie it around her head in various way with pretty effects. I would suggest you buy a couple of small bottles of silk dye. Pick two colours that go well in blends. You can dilute the dyes with water to the desired shade. It should say ‘steam set’ on the bottle and these are the ones you can also use in the microwave as long as the silk is very wet. My colour suggestions would be to use two colours of pink – soft rose quarz and a touches of a stronger magenta shade. This is a wonderful heart colour. Also soft green with turquoise. Refer to my video on this on YouTube for exact instructions. Just ensure that you put the very wet silk in the covered container in the microwave. If you have any further questions, please just ask. I want really bold colors on my silk and was wondering if there is a difference dying in the microwave or using a bamboo steamer. Will I get brighter colors using Jacquard Acid Dyes or Dye na flow paint. The microwave will never give as bold and vibrant colours as regular steaming does. And you are limited to working with very wet silk. As to choosing between Jacquard Acid dyes and Dyn na flow paint, I would always recommend using the Jacquard dyes. You can’t use the paints in the microwave anyway, only dyes. So use the Jacquard with the microwave and don’t dilute the dyes much for a stronger colour.